The roots of Audemars Piguet date back to 1875, when the 23-year-old Jules-Louis Audemars met Edward-Auguste Piguet, then only 21, at Vallée de Joux, which is considered to be the cradle of prestige watch-making. Their hometown was Le Brassus. When they graduated school they went to Vallée de Joux to start working in their favorite field of watch manufacturing. Thus Audemars started producing component parts for movements and Piguet got the job of a repasseur, whose job it was to make the final regulation of the timepiece. 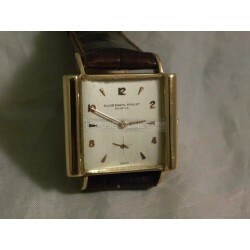 They founded a firm later known as Audemars, Piguet et Cie. Since 1882, members of the Audemars and Piguet families have always been on the board of directors and have thus directly or indirectly run the company. Today the company, along with Patek Philippe and Vacheron Constantin, is sometimes claimed to be one of the top three Swiss watchmakers. Every timepiece manufactured in-house is still made using the old-fashioned hand-made technique.NB WE REMIND YOU THAT A LOT OF OUR WATCHES ARE SOLD BY US FOR OUR CUSTOMERS...THIS MEANS THAT IF YOU WANT TO COME IN OUR SHOP TO SEE ONE OF THEM YOU HAVE TO CONTACT US TWO OR THREE DAYS BEFORE IN ORDER TO LET US TO HAVE THE TIME TO BRING THERE THE WATCH! 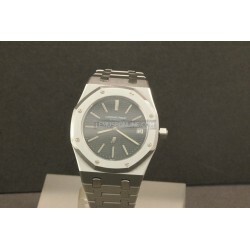 Audemars Piguet There are 3 products. 18kt yellow gold case ( size 31mmX26mm ) Hand winding movement Brown crocodile strap White dial With small seconds Plexi glass Reference 410 Rare model Made in the '40s Very nice conditions! -18kt yellow gold/steel case ( diameter 36mm )-Original steel/gold bracelet-Automatic movement caliber 2224/2810-Beautiful grey dial-With day and date-Sapphire glass-Reference 25572SA-Made in the '80s-Rare model-Very nice conditions-With its rare original box! Steel case ( diameter 39mm ) Original steel bracelet Automatic movement caliber 2121 Black original dial lightly damaged next to index at 1 and 2 o'clock With date Sapphire glass Reference 5402 Made in the '70s Rare B serial Very nice conditions!